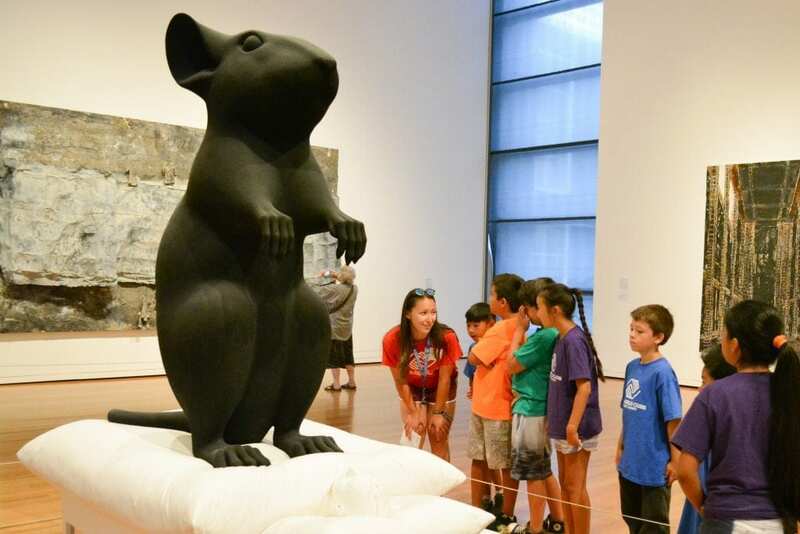 Youth observe “Mann und Maus” on display at the Seattle Art Museum. Club members were able to visit the Seattle Art Museum this summer. Stefano Perruccio, the Clubs’ Art Specialist was one of the chaperones for the trip. Stefano spends time at each of the Clubs coming up with thoughtful art projects for the youth to participate in and he was especially excited about this opportunity. “The museum trip offered an exposure to a variety of art within many cultures all over the world, from modern, to traditional, to indigenous all in one space. I enjoyed witnessing their engagement and energy,” he said. In addition to admiring the works of art, kids were challenged to remain quiet, not touch the work and adhere to boundaries set by the museum. A difficult feat, to say the least, but they all did a masterful job overall. Stefano remarked that he wished museums were more accessible to a younger audience, more interactive, and not so “buttoned-up”. This might have been one of the reasons that they loved the Three Empathics virtual display, part of the African art collection. The dark room featured neon-projecting, changing images on the wall and on the floor while playing calming music. Some of the youth mimicked the poses of the 3 seemingly meditating or yogic figures and let the images display on them as they lay on the floor. Exposure to different types of artwork has shown to have an impact on kids learning and overall academic health. Visiting the museum, and providing Club kids with an “adult” perspective on art is just one more tool that helps the Clubs achieve one of their priority outcomes of Academic Success. Last week the Anacortes Boys & Girls Club and The First Tee linked up to provide a unique experience for Club members. 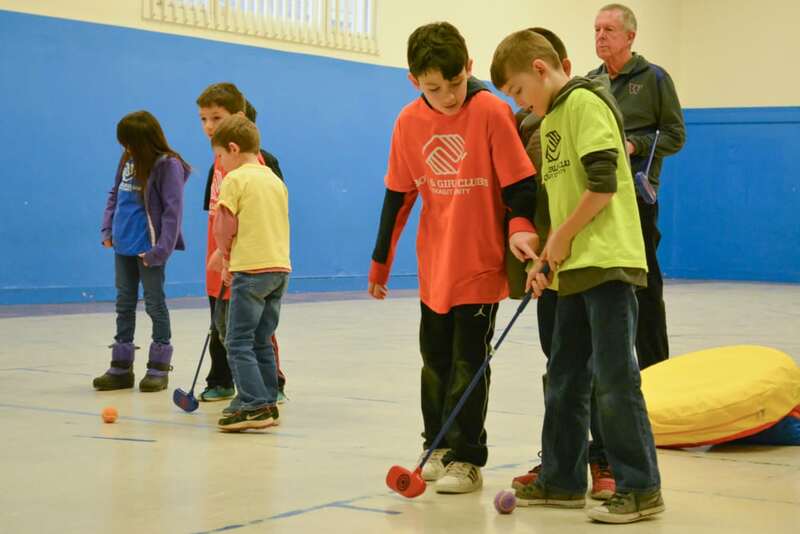 The snow was falling, but that did not stop local golf pro Tom Perry and First Tee Coordinator Kjell Carlsen from teaching 15 eager Club members basic golf skills in the Anacortes Club’s gym. The First Tee is an internationally recognized youth program that introduces the game of golf and its inherent values to young people. The learning program focuses on nine core values – honesty, integrity, sportsmanship, respect, confidence, responsibility, perseverance, courtesy and judgment. Anacortes’ local First Tee chapter is sponsored by Anacortes Sunrisers Kiwanis Club in partnership with Swinomish Golf Links, two organizations that also support the Boys & Girls Clubs. The program hopes to provide opportunities for fun, self-confidence, and sportsmanship skills for the kids who participate in their program. They offer Golf Clinics for ages 7-18, as well as a tournament in August. For most Club members, this was their first introduction to the game. Using oversized golf clubs, tennis balls, and velcro targets, members were able to safely achieve success. They worked on putting and chipping and tried to stay focused on “keeping their Y” in their golf swing with mentorship provided by Tom & Kjell. The First Tee Link Program and Boys & Girls Clubs of Skagit County share values that align for a great partnership, including the idea that any kid who wants to be part of the program will have an opportunity to do so. Moving forward, The First Tee hopes to work with the Boys & Girls Clubs of Skagit County to reach a diverse group of kids who have an interest in the sport of golf. Those interested in learning more about The First Tee Link Program can visit www.anacortestft.com. Throughout the year, Club Members at the Anacortes Boys and Girls Club had the opportunity to spend an hour reading every day, thanks to a local partnership with the Anacortes Public Library, who were able to provide some special reading opportunities for youth through their Pop-up Library Program. The program began last summer, and was so popular that they decided to continue into the school year. Children’s Librarian Leslie Wilson, visits the Anacortes Boys & Girls Club on a regular basis to host the Pop-Up Library. The system uses a new web-based library catalog that makes it possible to take library services out into the community. The Pop-up library was also very popular with the kids. “What I liked about the pop-up library was that we got to check out books without going to the real library. 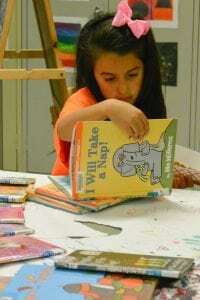 I also liked hearing the different stories Leslie read to us,” said Club Member Alaea Cerrillo. The Boys and Girls Club has a library of books that the kids can choose from, but the Pop-up Library expanded their choices. “I could tell how excited the kids were, because of how patiently they waited to check out their books. We run choice-based programs at the Club, so there are activities going on simultaneously. Lots of kids were choosing to look at the library books that were brought in and check out new ones for next time.” said the Club’s Marketing Director, Tammy Findlay. Wilson explained, “The Club members really enjoyed being able to request books. It was great seeing how excited kids were getting them. It also helped us really tailor the program to meet the kid’s interest.” Some of the most popular requests included Guinness Book of World Records, Pete the Cat, and graphic novels.